When it comes to my oily/combination skin I like to keep it in check (i.e spot free) with a good cleansing routine but also twice weekly face masks. I've been doing this for the longest time now and actual use it as a little pamper time. Clay masks are by far my favourite kind to use as they soak up excess oil, keep blackheads under control and spots at bay. 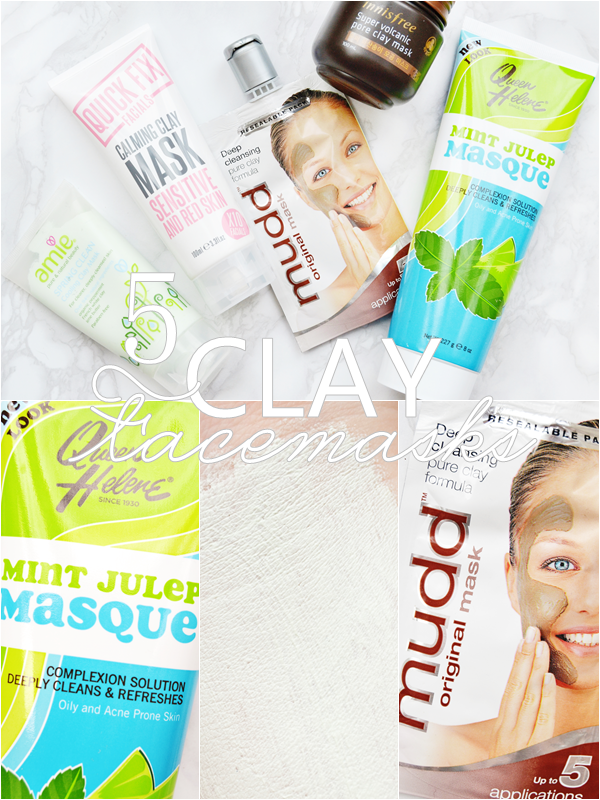 Over the years I've tried a lot of clay masks so I decided to whittle my collection down to my top 5 that I use the most and that I'd highly recommend to anyone with oily/blemish-prone skin. This is a mask that feels like a gigantic tube of toothpaste with it's spearmint scent and smooth consistency! Though I find both the scent and smoothness pretty relaxing. The Mint Julep Masque was something I'd had my eye on for months due to it being a US favourite and once I'd snapped it up from Amazon for quite a bargain price I really wasn't disappointed. With it's smooth consistency I expecting this to be a non-setting mask but in actual fact this is one of the quickest drying masks I own, though it doesn't dry too tight. For me this is a mask to use when my skin feels oilier than normal as its amazing at soaking up oil and controlling it. I also use this on individual spots at night to dry them out! A great all-rounder if you have over oily skin and blemishes from time to time. On to possibly my favourite clay mask! This is the wonderful Super Volcanic Pore Clay Mask from Innisfree, a Korean beauty brand that you can find on Yes Style. With a thick lava-looking consistency this is an industrial strength mask, one to really rescue the skin. Perfect for applying to just the t-zone or blackhead areas to really target and clear them. This of course doesn't make blackheads vanish but it definitely makes them less unsightly and your skin will look brighter and firmer on the whole. I also love that the mask is pretty much fragrance-free and a little goes a long way. If someone I know has oily skin this is the face mask I recommend as it's cheap, widely available in the UK and most importantly it works damn well. This is a true oil-absorbing mask, you can even see it as the mask dry, it's also great on blackheads to clean and tighten them. The only down side is that the mask does dry very tight to the point of it feeling slightly uncomfortable, oh and it does smell slightly odd, but if you can put up with that you will love the results it gives. Another true favourite that I use often. 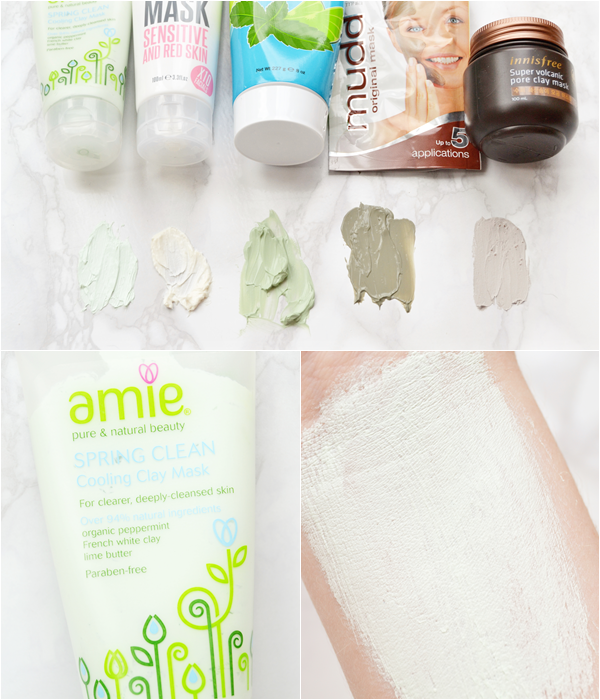 If you have sensitive combination skin it can be tricky to find a non-drying clay mask but here it is! A beautiful gentle face mask that targets generally misbehaving skin - from redness, skin irritation and spots. I personally like to use this on hormonal skin as it's calming and great to pamper my skin with, especially the non-drying aspect. Quite a specific mask but one that can be used on all different skin problems as it's gentle and soothing. Ahhh my favourite spring/summer mask for when my skin is hot and oily. This is without a doubt the best smelling clay mask I've come across, smelling of.... lemonade! Yes, it's zingy and lemon-y - just perfect! As well as the lovely scent the feel of the mask on the skin as it dries is cooling and relaxing something quite unique. This is another hard setting mask but just the right amount. If you have oily or blemish prone skin and you spot this seriously just snap it up! I'm really thinking this could be my favourite over the Innisfree Volcanic mask now! 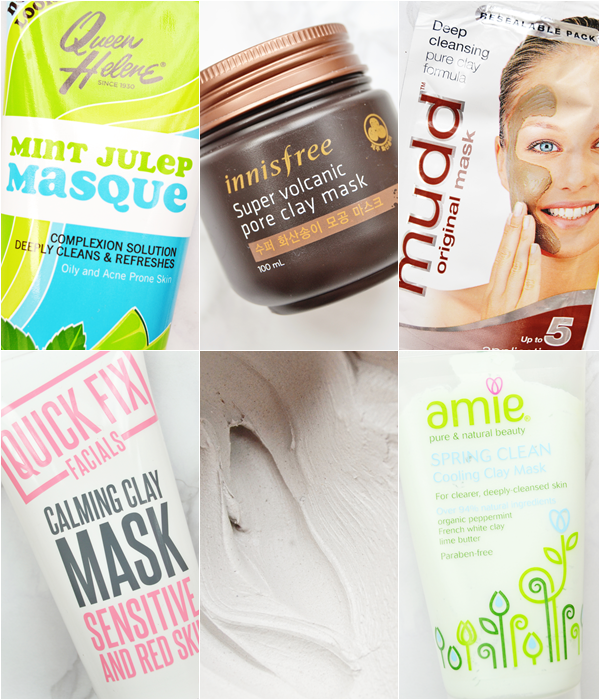 Are you a fan of clay masks? If you are, let me know your favourite one (I will probably end up buying it)!